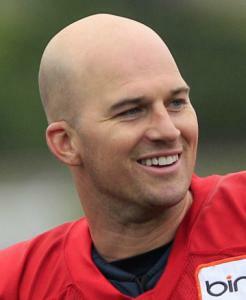 Matt Hasselbeck may be 35 years old, but in a way he’s feeling like a rookie again thanks to the lockout. Normally at this time of year players are actively involved in workouts at team facilities, but the month-old lockout has forced them to make other plans. At one point Hasselbeck, a native of Norfolk who has played 12 NFL seasons, 10 with the Seahawks, said he was throwing passes to Seattle tight end John Carlson “in a parking lot in front of a Goodwill and a mattress store.’’ Hasselbeck just completed his second week at Athletes’ Performance in Phoenix. But overall there’s been a lot more downtime than he’s used to. That includes his two brothers, and parents Don and Betsy Hasselbeck, who still live in the house they bought in 1978, one year after Don was drafted as a tight end by the Patriots out of the University of Colorado. The far-flung family got some rare time together recently when the Hasselbecks were honored for their charitable work with the “Golden Heart’’ award during an annual gala held by Athletes First, the agency that represents Hasselbeck and several other NFL players. So while the offseason has been nice for Hasselbeck, whenever a new collective bargaining agreement is forged between the owners and players, he’ll have to deal with a new, stark reality as a free agent. Hasselbeck and the Seahawks failed to reach an agreement on a new contract before the lockout. “I would put myself in the same boat as probably 500 other guys,’’ Hasselbeck said. “It’s kind of hard to do a deal without knowing what the rules of the game are, and so most of us free agents were just kind of sitting in a holding pattern until this new CBA comes down. And we all knew it was going to be that. There’s maybe a handful of guys that were going to definitely get done before the lockout began and I truly thought that I would be one of those guys potentially, because of my desire to stay and everything [the Seahawks] had told me. But it didn’t happen and that’s OK. I’m not upset about anything. I understand it’s kind of a weird year and it’s a hard year to forecast. As for his talks with the Seahawks, Hasselbeck said there was little doubt in his mind that the team wanted him back before the lockout forbade communication between player and team. At one point late last season it looked as if Hasselbeck was playing out his final games with the Seahawks, who had traded for and spent a lot of money on quarterback Charlie Whitehurst. The Seahawks, with Whitehurst starting for an injured Hasselbeck, won the season finale against the Rams to capture the NFC West with a 7-9 record. But Hasselbeck returned for the playoffs and had a career game, throwing for 272 yards and four touchdowns in an upset of the Saints. The Seahawks lost to the Bears in the divisional round, but Hasselbeck had solidified himself as a veteran who wasn’t quite finished. “I loved playing for Pete [Carroll],’’ said Hasselbeck. “I really like the group of coaches he brought with him and the staff that he assembled. The trade for Charlie was, I think in a way they felt it was necessary because the organization really hadn’t invested in the quarterback position in so long. We went years without really drafting or addressing the situation. So that was not a big deal at all. The hardest thing was just all the roster turnover that we had. I think we had 284 roster moves, and for that reason, as quarterback of the team, I just felt like it was the toughest year trying to just work with a new combination of teammates seemingly every week. It was challenging. But I would also say it’s probably the year that I’m most proud of in terms of just holding it all together, guys weathering the storm and coming together as a team. Hasselbeck is a realist. He realized the Whitehurst trade wasn’t a reflection on him, it was part of the business and he dealt with it. So Hasselbeck also realizes the Seahawks — or another team he ends up with — could pluck a young quarterback in the draft. One possibility is Jake Locker from the nearby University of Washington, whom Hasselbeck has gotten to know well. “He’s a great kid, just a wonderful, wonderful guy,’’ Hasselbeck said. “I feel like he’s the kind of guy who would be a great leader on a football team. Just really, really gifted and talented. Almost off the charts with his strength and explosiveness and his running ability. I’ve just seen him play a little bit, but just an awesome guy to be around. He’s just got some of those qualities that you just can’t coach. And don’t think for a second that Hasselbeck would resent a young upstart. Being a mentor as his career winds down is something that interests him. But that’s for later. Hasselbeck has an offseason to enjoy. Those don’t happen very often. Some already seeking loans Barely into the second month of the lockout, there’s already been some disturbing news on the financial front for players. Players from at least 16 teams have at least shown interest in taking out short-term loans with high interest rates and fees, according to a report from ThePostGame.com. The report cited a source that indicated the interest rates range from 18 to 24 percent, and could rise to as high as 36 percent on default. Players from the Patriots were not mentioned in the story. Seahawks quarterback Matt Hasselbeck, who serves on the board of the directors for the team’s NFL Players Association chapter, had not read the story but said players had been advised to save for the lockout for two years. Reports have recently surfaced about the NFLPA’s “lockout fund,’’ in which players who were active the past two seasons could receive up to $60,000 in six installments while the players are locked out. Those payouts began on Friday. Hasselbeck said the fund hasn’t been accurately depicted. That money has been funded by the players, not fronted by the NFLPA. On the surface it’s mildly troubling that players, who at minimum made $250,000 a year, can’t ride out a few months on their salary. But what many don’t understand is aside from roster or workout bonuses given to about half the players during the offseason, players make most of their money during the season when their base salary is distributed in each of the 17 weeks of the regular season. And for young players, lockout expenses can add up if they’re not fronted by their agents. “Right now, you typically get $400 a week to work out,’’ Hasselbeck said. “And then you still have health insurance. But right now no one has health insurance, so you’re paying for health insurance through COBRA, which is not cheap. And you’re not getting paid to work out and then if you’re serious about your job you’re probably somewhere now where you are now paying to work out. So the opportunity revenue is gone so it’s kind of a switch, especially if you’re a young guy. It’s a monthly swing that could be pretty significant. 1. Carolina Panthers — Cam Newton, QB, Auburn. Unless the Panthers are putting out one heck of a smoke screen, they’re going with Newton’s high upside as opposed to instant impact. 2. Denver Broncos — Marcell Dareus, DT, Alabama. The Broncos are in desperate need of a tackle who can anchor coach John Fox’s 4-3. 3. Buffalo Bills — Von Miller, LB, Texas A&M. The Bills tied for 27th with 27 sacks last season and need a ton of help. 4. Cincinnati Bengals — A.J. Green, WR, Georgia. Patrick Peterson is almost too good to pass up here, but the Bengals opt to make Carson Palmer happy. 5. Arizona Cardinals — Patrick Peterson, CB, Louisiana State. The Cardinals go for one of the surest players in the draft. 6. Cleveland Browns — Robert Quinn, DE, North Carolina. Would be a landing spot for Da’Quan Bowers, but knee concerns push him down. 7. San Francisco 49ers — Blaine Gabbert, QB, Missouri. There are accuracy concerns, but Jim Harbaugh gets the quarterback he needs. 8. Tennessee Titans — Nick Fairley, DT, Auburn. Julio Jones could get a look here with Kenny Britt’s troubles, but Titans go with best available. 9. Dallas Cowboys — Tyron Smith, OT, Southern Cal. Offensive line coach Hudson Houck prefers size over athleticism, but upside is too good to pass up. 10. Washington Redskins — Julio Jones, WR, Alabama. The Rams could move up to take Jones. If not, the Redskins will add a playmaker. 11. Houston Texans — Prince Amukamara, CB, Nebraska. Do you fix Houston’s atrocious secondary with a pass rush or cover guys? 12. Minnesota Vikings — Cameron Jordan, DE, California. Jordan’s father, Steve, was a Pro Bowl tight end for the Vikings, who are desperate for line help. 13. Detroit Lions — Anthony Castonzo, OT, Boston College. If the Lions really want to see what Matthew Stafford can do, they have to keep him upright. 14. St. Louis Rams — Corey Liuget, DT, Illinois. Unless they trade up without a rookie cap on the horizon, Rams wait for wide receiver help. 15. Miami Dolphins — Mike Pouncey, G, Florida. Jeff Ireland resists taking Mark Ingram and goes with a safe, need pick. 16. Jacksonville Jaguars — Ryan Kerrigan, DE, Purdue. They get a younger version of Aaron Kampman, whom Kerrigan will bookend. 17. New England Patriots — J.J. Watt, DE, Wisconsin. Aldon Smith and Gabe Carimi are tempting, but Watt is a perfect Patriot who fills a need. 18. San Diego Chargers — Cam Heyward, DE, Ohio State. The Chargers need a better anchor on the defensive line and get him here. 19. New York Giants — Gabe Carimi, OT, Wisconsin. The Giants need to begin rebuilding their offensive line. 20. Tampa Bay Buccaneers — Da’Quan Bowers, DE, Clemson. They’d be thrilled if the talented Bowers falls because of concerns about his knee. 21. Kansas City Chiefs — Aldon Smith, DE, Missouri. Scott Pioli could go in a number of directions, but this is too good an athlete to pass up. 22. Indianapolis Colts — Nate Solder, OT, Colorado. Bill Polian is still kicking himself for passing on Rodger Saffold last year. 23. Philadelphia Eagles — Jimmy Smith, CB, Colorado. Some character issues but is too talented to pass up in area where help is needed. 24. New Orleans Saints — Muhammad Wilkerson, DT, Temple. Saints need to get better up front to help out the secondary. A linebacker is possible. 25. Seattle Seahawks — Danny Watkins, OG, Baylor. Seahawks were terrible on the line last season and Watkins can play anywhere. 26. Baltimore Ravens — Akeem Ayers, LB, UCLA. Ravens need an upgrade opposite Terrell Suggs and Ayers’s athletic ability would fit nicely. 27. Atlanta Falcons — Adrian Clayborn, LB, Iowa. There are some medical concerns, but Falcons can’t pass on the rush. 28. Minnesota Vikings — Jake Locker, QB, Washington. Patriots flip this pick for a 2012 first-rounder and a 2011 selection. There is not good value here, but if Patriots stay they pick Derek Sherrod. 29. Chicago Bears — Derrick Sherrod, OT, Mississippi State. Bears need help on the line and Sherrod could start at guard and then move outside. 30. New York Jets — Phil Taylor, DT, Baylor. With Kris Jenkins not likely to return, the Jets need bodies in the middle. 31. Pittsburgh Steelers — Aaron Williams, CB/S, Texas. As we saw in the Super Bowl, the Steelers need help in the secondary. 32. Green Bay Packers — Jabaal Sheard, OLB, Pittsburgh. Expect Packers to deal out for a team seeking a quarterback. If they stay, Sheard brings needed pass rush to complement Clay Matthews. Jets’ Ihedigbo doing his part Amherst native and former UMass standout James Ihedigbo continues to make a large impact off the field. The Jets safety was honored April 9 as the Nigerian Healthcare Foundation Faces of Hope Humanitarian of the Year. Ihedigbo recently traveled to Nigeria, from where his parents emigrated more than 30 years ago, with several NFL coaches and players to put on a three-day flag football clinic for 200 children. In 2008, Ihedigbo founded the HOPE (Help Our People Excel) Africa Foundation, which helps fund scholarships to American universities, agriculture and community development projects, and tutoring and mentoring programs. Ihedigbo also traveled to Haiti last year to assist in earthquake relief efforts.